On my recent tour to Acadia I went to the top of Cadillac Mountain with a couple of the workshop participants for some night photography. The moon was shining and providing some nice light over Frenchman's Bay. We also used a flashlight to paint the foreground in. The wind was gusting rather strongly. More than once I was nearly blown over. Fortunately, we were able to duck behind a wall at the edge of the parking lot. 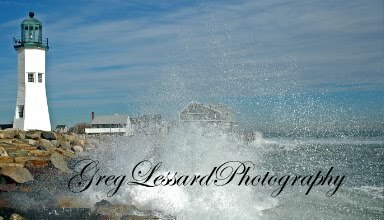 In an effort to keep the camera from shaking in the wind, I would huddle around it after I tripped the shutter. This is an effective technique that helps to keep images sharp even in bad weather. 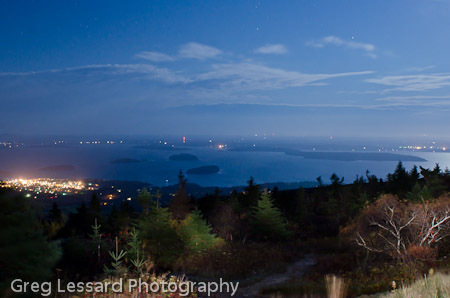 Finding new ways to photograph Acadia National Park is always a challenge. While I am sure that night photography has been done from the top of Mt. Cadillac before, I have not seen any other images like this one. It was worth staying out late and braving fierce winds.